If you are a travel vlogger, use YouTube to promote your services, or make a living as a full-time videographer, you will know that YouTube changed its monetisation policy in 2018. 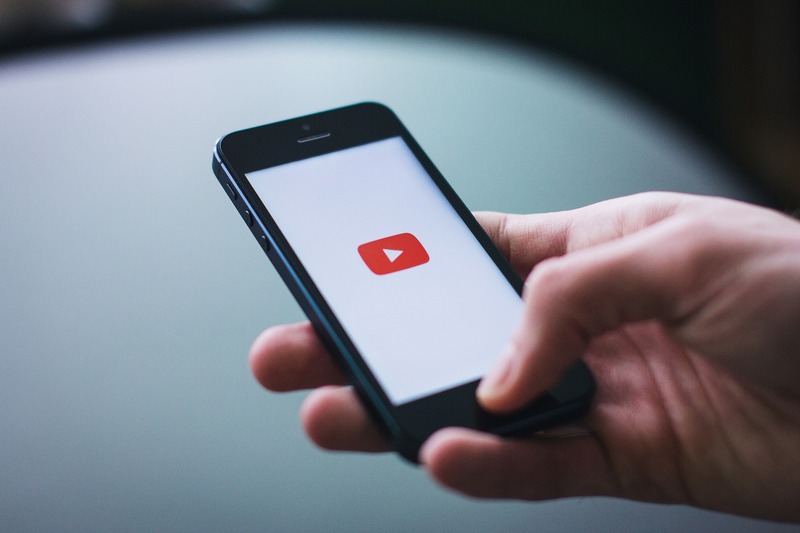 In a plan to prevent spammers from raking up views and advertising revenue, YouTube introduced new thresholds that video creators must reach before they can monetise their videos. The new policy caused a furore among smaller creators, who are seeing the goalposts for monetisation being moved further and further away. At least 4,000 watch-time hours overall over the past 365 days. Additionally, the channel overall must reach at least 10,000 views. These measures apply not only to newer YouTube creators, but also to established vloggers who have been uploading content on the platform for years. YouTube gave creators one month’s notice to reach the new thresholds. 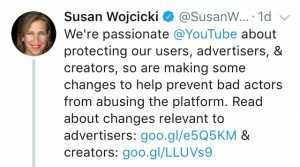 Failure to achieve this, existing creators will stop receiving advertising revenue on their channel. Will live streams still be available even when you don’t reach the threshold? Will custom URLs still be valid? Will scheduled uploads be posted as normal? Will custom thumbnails still be available? 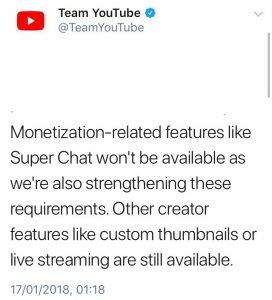 The YouTube support team on Twitter reassured that all the above features remain available, regardless of channel size. The aim of the new monetisation thresholds is to prevent spam and abuse. Therefore, any video creators with irregular activities such as asking for people to subscribe to each other’s channels will be penalised. Be careful in your quest to reach 1,000 subscribers, as over-enthusiastic outreach to grow your channel quickly will be flagged as spam. Here are some tips which may help you reach the new thresholds, if you still haven’t got 1,000 subscribers, 4,000 watch-time hours and 10,000 overall views. If you want to get noticed for all the right reasons, leave positive and constructive comments on other people’s videos. Never ask people to check out your channel or offer a “sub4sub”: subscribing to a channel and asking for a subscription back may result in losing the new subscriber after a few days and not getting any watch time on your videos. Let go of the expectation that people will reciprocate. Only subscribe to channels you are genuinely interested in because of their content. YouTube is likely to give you a community strike if you ask people to subscribe back when commenting on their videos. Reach out to influencers offering something of value. For example, if influencers ask for information on a country they are visiting and you know all about that country, or maybe they ask for restaurant recommendations and you can help, offer useful information. Asking an influencer to subscribe to your channel or watch and retweet your videos is frowned upon and will likely get you blocked on social media. podcasts, which can be a good solution if you are too shy to speak in public or don’t want to appear on camera. You can create a podcast, recording your voice and displaying either a fixed image or a slideshow throughout. Alternatively, if you enjoy appearing on camera, you can have a series of interviews with experts in your field, or do a solo show with your thoughts on a variety of topics. A good example is the Jenna Julien podcast. playlists, because they get people to watch more videos in a sequence. You can plan to discuss a topic over three-five episodes, even film a short drama if you want to express your creativity, or show the progression of a topic from start to finish over the course of a few videos. For example, when I learned how to make sourdough bread, I was inspired by Alex the French Guy Cooking, who made a series on this topic. I then made my own pizza-making playlist on my YouTube channel. Use offline networking opportunities to let others know about your content – of course, try to avoid doing a sales pitch. If, in conversation, you notice that someone may be interested in what you have to offer, talk informally about a video that received a lot of engagement. You can show that you can create a buzz about a company through video, for example. Make sure your business card includes a personalised YouTube URL. How to do make useful and engaging content? Have a look at your YouTube analytics: which videos are performing better than others? Can you spot a pattern? Are there any topics that are more popular and that you are an expert in? Video tutorials continue to be extremely popular on YouTube, and so are product reviews. According to Google, 40% of YouTube viewers watched a product review before buying it. Instead of the traditional “money back guarantee” whereby you buy a product, try it, and, if it doesn’t suit your needs you send it back, with video reviews you get to see the product in action before buying it. You also get to know if there are any design faults or issues in advance. This is particularly useful for technology products. Other popular videos include travel vlogs (with the obligatory drone and GoPro footage! ), teaching sales and marketing skills, self-development and technology trends. Keep creating and share your unique talents with the world!